Heating is the main source of energy usage in a building. Loss of heat can be down to either warm air leaving the building through unplanned ventilation, or by thermal loss directly through the building fabric. Creating an airtight, well insulated building envelope will ensure your home is comfortable to live in and performs as efficiently as possible. We constantly see builders buying a cheap timber frame kit, spending a fortune on good insulation and air barriers but then have it poorly fitted by under skilled labourers. The kit isn't designed with installing the insulation In mind and many areas are under insulated, if at all. As little as a 3mm gap around a ridged insulation panel will allow air convection currents and reduce the efficiency by up to 60%. This means the customer, although having paid for the top insulation, is in fact achieving nowhere near the u values they think they are. Often this means a much cheaper easier to fit rockwool insulation would have actually performed better. 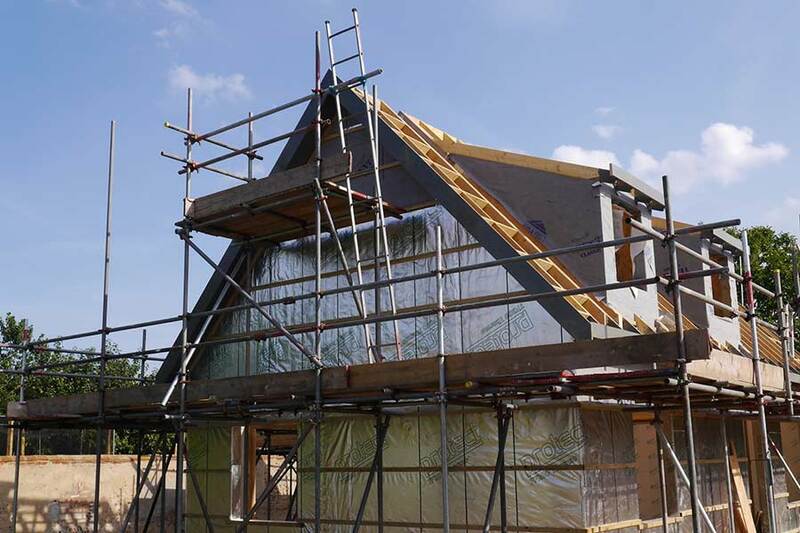 Our timber frame is designed with the fitting of the insulation and the air barrier in mind. We constantly work on simplifying our design details to make air tightness more achievable. We use details such as service voids to contain the wiring and pipe work. This makes air tightness easier and allows for a continuous layer of unbroken insulation giving lower u values. By factory fitting the insulation we can ensure it's perfectly installed, and our skilled installers work to strict checklists to make sure nothing is left to chance. We take great care in making the most out of the materials we are using and strive to make your building as energy efficient as possible. All our buildings are bespoke and can be made to a number of specifications. Our standard closed panel system achieves u values as low as 0.16kw/m2k.c and air tightness of 2.